Most magnetic resonance (MR) studies evaluating the rotator cuff for tears have used T2-weighted imaging in the coronal oblique and sagittal oblique planes, T2*-weighted gradient echo imaging, however, has advantages over spin echo imaging, including contiguous slices without cross-talk, high contrast around the cuff, and intrinsically shorter imaging times which can be used to increase the number of signals averaged and thus improve the signal-to-noise ratio. 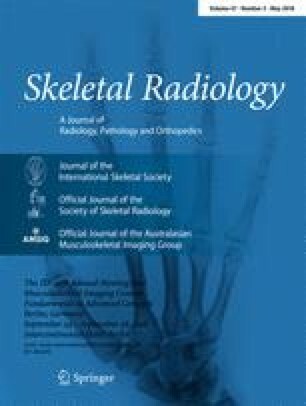 We reviewed the shoulder MR scans of 87 consecutive patients who underwent both a MR scan and a shoulder arthroscopy during which the size of tears, if present, was graded. The reviewers were blinded as to the history and arthroscopic results. The MR scans included oblique coronal T2*-weighted gradient echo and oblique sagittal T2-weighted spin echo images. MR cuff grades were correlated with arthroscopic findings. For complete tears, the sensitivity of MR was 0.91 and the specificity 0.95. For partial tears, the sensitivity was 0.74 and the specificity 0.87. This accuracy is similar to two-plane T2-weighted imaging as previously reported in the literature. There was a statistically significant correlation (p < 0.0005) between the cuff grade as determined by MR and the arthroscopic findings.